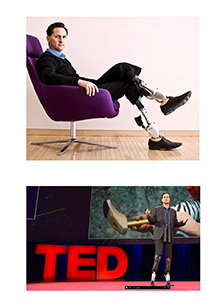 Hugh Herr is creating bionic limbs that emulate the function of natural limbs. Time Magazine coined Dr. Herr the ‘Leader of the Bionic Age’ because of his revolutionary work in the emerging field of Biomechatronics – technology that marries human physiology with electromechanics. A double amputee himself, he is responsible for breakthrough advances in bionic limbs that provide greater mobility and new hope to those with physical disabilities. He is currently Associate Professor of the Biomechatronics research group at the MIT Media Lab. Herr is the author and co-author of numerous peer-reviewed manuscripts and patents, chronicling the science and technology behind his many innovations. These innovations include Computer-Controlled Artificial Knees, Active Leg Exoskeletons, and Powered Ankle-Foot Prostheses. A computer-controlled knee prosthesis called the Rheo, which is outfitted with a microprocessor that continually senses the joint’s position and the loads applied to the limb, was named to the list of Top Ten Inventions in the health category by TIME magazine in 2004. A powered ankle-foot prosthesis called the BiOM, which emulates the action of a biological leg and, for the first time, provides amputees with a natural gait, was named to the same TIME top-ten list in 2007. He is the Founder and Chief Technology Officer of BionX Inc., a company that commercializes the BiOM Ankle-Foot Prosthesis, first in a series of products that will emulate or even augment physiological function through electromechanical replacement. Today the BiOM Ankle-Foot Prosthesis has been clinically shown to be the first leg prosthesis in history to reach human normalization, allowing amputees to walk with normal levels of speed and metabolism as if their legs were biological once again. Herr has received many accolades for his groundbreaking innovations, including the 13th Annual Heinz Award for Technology, the Economy and Employment; the Prince Salman Award for Disability Research; the Smithsonian American Ingenuity Award in Technology, the 14th Innovator of the Year Award, and the 41st Inventor of the Year Award. 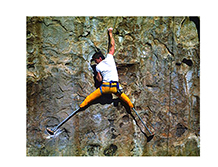 Hugh’s story has been told in a National Geographic film, Ascent: The Story of Hugh Herr; and episodes and articles featured in CNN, The Economist, Discover and Nature.